If you are going to build a web site, you firstly need to apply a domain name and hosting plan which allow people to browse your web site in internet through your domain name. It is important to get a meaning domain name which can reflect the purpose of your web site or represent your band name, then, it is easier for people to remember your web site. I used to maintain my domain in hostgator.com before, and I was happy with it. However, recently, the service quality of hostgator.com was spiralling downwards. 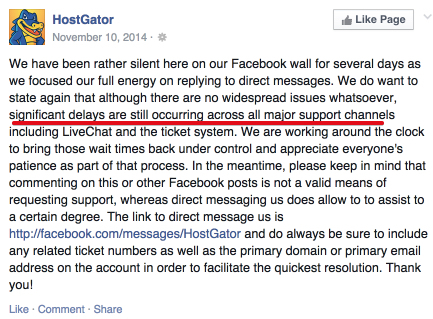 Especially, in year 2014, it has a bad record which year 2014 was a tumultuous year for HostGator users. The network experience some more very serious DDOS attacks by various groups costing their clients MILLIONS of dollars in business. Some of these outages were hours, some were even over a day in length. When many of their dedicated hosting clients (paying upwards of $400 per month to host their WordPress websites) said they had enough and were jumping ship, Hostgator had nothing to offer in response other than “attacks happen”. The first issue here is their service going down. The second issue, is once the service isn’t working and I am losing money as a customer is NOT being able to get a proper level of help to put my mind at ease. #fail. Recently, I found another domain and hosting provider called namecheap.com, which provides much better service quality and feature than hostgator.com and also the cost of namecheap.com is cheaper than hostgator.com. You can see from the banner ad below that its domain cost is just $3.98 per year, and its VPN hosting cost is just $16.95/mon. The comparison of basic hosting plan for a single domain is as below, which namecheap.com is still the lowest cost provider. I registered a wrong domain name in Namecheap.com before. According to the Clause 10 of the Registration Agreement in Namecheap, all domain name registrations are final and non-refundable. However, the Namecheap support guy still provided me an exception to cancel my registration of wrong domain and issued me a refund, which they could ignore my request but they did not. Hence, I was highly appreciate their service. I highly recommend Namecheap.com Service. If you want to trynamecheap.com service, you can click its link <<HERE>>.